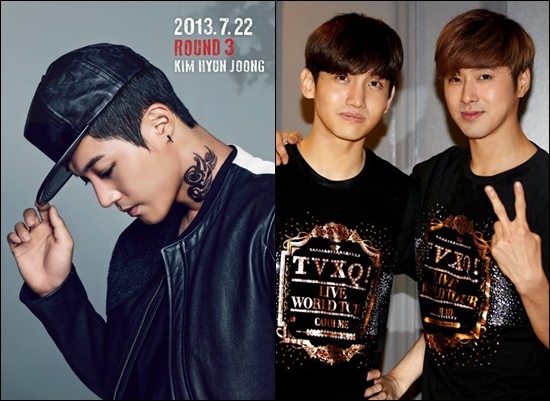 K-pop acts Kim Hyun Joong and TVXQ's respective singles have been certified gold in Japan. Kim Hyun Joong's third Japanese single "Tonight" and TVXQ's new single "Ocean" have sold at least 100,000 copies each, according to the latest certifications issued by the Recording Industry Association of Japan (RIAJ). "Tonight," which was released on June 5 in Japan sold 101,818 on its first day to land second place on Oricon's daily singles chart. "Ocean," on the other hand, sold 88,428 copies upon its release last June 12. In RIAJ's latest certifications, NMB48's "Bokura no Yuriika" was certified double platinum. Platinum status was given to Kanjani8, SMAP and Hey! Say! JUMP. EXILE, EXILE Takahiro, Super Girls, TVXQ and Kim Hyun Joong got gold certifications. On albums released in June, B'z got double platinum status while Kyary Pamyu Pamyu, GReeeeN, May J. as with a various artists release were certified gold. On Oricon's monthly singles chart for June, "Ocean" ranked fifth while "Tonight" ranked sixth. The chart is topped by Japanese group NMB48 followed by SMAP, Kanjani8, Hey! Say! Jump, TVXQ, Kim Hyun Joong, EXILE, EXILE Takahiro, Super Girls and AKB48. Kim Hyun Joong is busy preparing for the release of his third Korean mini-album "Round 3" scheduled on July 22. The album contains six songs including the title track "Your Story (featuring Dok2)." Rapper Jay Park wrote the lyrics and is also featured in the song "Unbreakable." Steven Lee, who was the main album producer for "Tonight," composed the two songs for Kim Hyun Joong's upcoming album.